Crime thrillers tend to give that adrenaline rush and the euphoric feel of what-next. They keep you at the edge of your seats with some nail-biting moments. Some crime thrillers involve the audience to join them and solve the mystery behind the crime committed in the film. 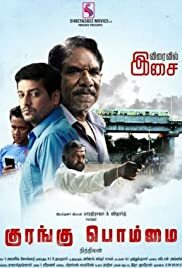 There are many excellent crime thriller movies in Tamil which are critically-acclaimed as well as commercially successful. Especially, 2017 delivered a bunch of extremely well-made crime thrillers. Here are 12 best new-age crime thriller Tamil movies that are sure to keep you hooked. This was an innovative crime thriller which involved science fiction in it. With a compelling screenplay and good performances from the lead cast, this underrated crime thriller of 2017 was a definite treat for mystery enthusiasts. This was C.V. Kumar’s directorial debut and it had Sundeep Kishan, Lavanya Tripathi, Jackie Shroff and Daniel Balaji in the lead roles. Music was composed by Ghibran and it was released on Dec 14th, 2017. Synopsis: A mentally upset police officer finds a common link between a series of murders happening in the city. With the help of a psychiatrist and a scientist, he tries to solve the mystery. Will the murderer be captured before it is too late? A Sherlock Holmes style detective movie, this crime thriller was well received by the audience for its unique content and engaging story. Directed by Mysskin, this movie had Vishal, Prasanna, Anu Emmanuel, Vinay Rai and Simran in the lead roles. Though being a multi-starrer, every actor shared equal screen space in it. Background score was composed by Arrol Corelli (there were no songs in the movie). It was released on Sep 14th, 2017. Synopsis: A private detective takes up the case of a missing dog and finds a more sinister conspiracy behind the crime while investigating it. Will he be able to solve the crime with his wits? Though the movie was underrated, it was highly appreciated for its different story and engaging execution. It also bordered on the lines of being a drama crime thriller, rather than an investigative thriller. Directed by Nithilan Swaminathan, it starred Vidharth, Bharathiraja, Delna Davis and Elango Kumaravel in the lead roles. Emerging music director Ajaneesh Loknath composed the music and it released on Sep 1st, 2017. Synopsis: Sundaram works under a gangster named Ekambaram. The latter asks the former to smuggle an expensive idol. But Sundaram and his son Kathir get entangled in a web of events manipulated by the antagonist Sekar. Dubbed as a neo-noir action crime thriller film, this blockbuster movie had equal dose of crime and action. A gripping screenplay and exhilarating performances led the movie to its success. 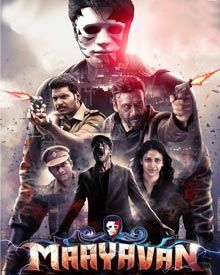 It had Madhavan, Vijay Sethupathi, Shraddha Srinath and Varalaxmi Sarathkumar in the lead roles, with Madhavan playing a cop and Vijay Sethupathi playing a much-wanted gangster. Pushkar-Gayathri directed the movie and it was released on July 21st, 2017. The movie is still enjoying a good run in a couple of theaters in the city. Synopsis: Vikram, an honest police officer, goes on a suspenseful hunt for a murderer named Vedha. However, things take a turn when Vedha narrates his life’s story and tries to persuade Vikram to change. What happens in the end? This movie was a well-written investigative thriller which had emotional moments, romance and action packaged in it. It became a superhit for Arun Vijay, who shot to success with his effective performance. Apart from him, Mahima Nambiar, Vijayakumar and Vamsi Krishna starred alongside him. Based on a Rajesh Kumar novel of the same name, this movie was directed by Arivazhagan and music was composed by Vishal Chandrasekhar. It released on March 3rd, 2017. Synopsis: A strict ACP investigates a series of murders and finds the medical industry to be at fault. The case turns out to be personal and he engages in a wild chase to solve it. Directed by debutante Karthick Naren, this crime thriller went on to become a successful venture only by word-of-mouth. With a thrilling story and mind-boggling scenes, this racy thriller can be easily considered as the best crime thriller of the decade. It had actor Rahman in the lead along with many newcomers. Jakes Bejoy composed the music and the movie saw a release on Dec 29th, 2016. Synopsis: A retired police officer reveals the details of an unsolved case to his friend’s son. However, things take an ugly turn when the listener turns out to be someone related to the case. Will the police officer survive to finish the tale? This movie had a low-key release and did not become commercially successful, though it was critically-acclaimed and was screened in many film festivals. Some critics even claimed the movie to be a perfectly-made crime thriller with all the right elements. Starring Vidharth, Pooja Devariya and Aishwarya Rajesh in the lead roles, this movie was directed by M. Manikandan. Ilaiyaraaja composed the background score and it released on Sep 2nd, 2016. Synopsis: A collection boy with a tunnel vision (medical condition) witnesses a murder of a woman. Using his other senses, he sets out to solve the murder mystery. Will he be successful? A remake of the 2013 Malayalam movie Memories, this crime thriller too involved a police officer and his antics to solve a murder mystery. Though it didn’t match up to the original, Arivazhagan did justice by inducing some engaging moments and retaining the central theme intact. It had Arulnithi and Aishwarya Rajesh in the lead roles. Music was composed was S. Thaman and the movie released on Feb 26th, 2016. Synopsis: A police officer finds solace in alcohol after his wife and daughter are murdered by revengeful criminals. He then begins to investigate a case that connects several murders in the city. Will he redeem himself through this case? This was a highly successful commercial venture which saw the comeback of actor Arvind Swamy. It was his character Siddharth Abhimanyu which brought laurels to the movie. 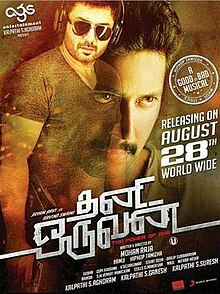 Jayam Ravi played an IPS officer who chooses the antagonist as his next target and sets out to capture him. The film received extremely positive reviews and went on to become a blockbuster. Directed by Mohan Raja, this movie had Nayanthara playing the female lead and Hiphop Tamizha composing the music. It released on Aug 28th, 2015. Synopsis: An honest and intelligent police officer decides to expose the illegal medical practices undertaken by a well-known scientist. Will he be successful in his venture? Remake of the blockbuster Malayalam crime movie Drishyam, this thriller film had Kamal Hassan in the lead along with Gautami, Niveda Thomas and Asha Sarath. Apart from having a crime theme, this movie had equal dosage of family sentiments, love and drama. Though the movie had a tough competition in the form of Baahubali, it emerged successful. Directed by Jeethu Joseph, it had Ghibran as the music composer and was released on July 3rd, 2015. Synopsis: A low-profile cable service businessman desperately tries to protect his family from the hands of law after they accidentally kill a police officer’s lecherous son. After a long gap in Tamil cinema, this movie released as the much-wanted private detective crime thriller film. It was highly appreciated for its out-of-the-box thinking and impressive screenplay. Ashok Selvan, Janani Iyer and Jayaprakash played the lead roles. P. Ramesh directed the movie and music was composed by Nivas K. Prasanna. It released on Feb 28th, 2014. Synopsis: A private detective lands up working in a lesser-known detective agency. However, the agency has ulterior motives which make him end up in a soup. Will he solve the mystery and weed himself out? More than a crime thriller, this movie bordered on the lines of a psychological thriller film. What worked in the movie was the intelligent execution of a simple storyline. The movie had Vijay Antony, Siddharth Venugopal and Rupa Manjari in the lead roles. Vijay Antony composed the music also. Directed by Jeeva Sankar, this movie released on Aug 15th, 2012 and went on to become a superhit. Synopsis: A juvenile prisoner grows up to be an orphaned man. He impersonates his dead co-passenger’s identity and acquires an entrance into a medical college. However, his past comes to haunt him and in the process he accidentally kills his college-mate. Will he be able to cover up the crime?